progeCAD, the leading solution provider in CAD software, just released the latest progeCAD Architecture 2014 version. This newest cad application is well matched with AutoCAD and other CAD programs having ability to work with DWG/DXF/IFC file formats. 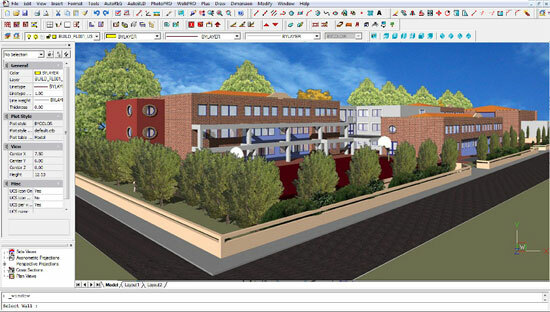 progeCAD Architecture 2014 integrates cutting edge BIM technology and supports 2D/3D and native DWG. The user will be able to perform with directly on a 3D model that keeps the speed of execution and editing intact and provides great creative freedom throughout the modeling phase. Now complicated parametric objects like doors, windows, roofs, stairs, 2D/3D furnishing can be directly included in a 3D model monitoring their interaction and transformation in real time. Instant visualization of all changes in 2D and 3D significantly saves up time and minimizes mistakes while reworking on a project. The CAD professionals can include better flexibility to their design progression through IFC 2×3 file format import and export and multiple viewport features of progeCAD Architecture 2014.
progeCAD supports the IFC file format as well as the standard object-based file format by a data model and these features make it perfect to perform with other BIM applications like Allplan, Revit, ArchiCAD. The IFC format facilitates importing and exporting building data, along with multifaceted objects like stairs and roofs and minimizes the possibilities for loosing data to a great extent. The software is capable of producing several viewports on a single layout. It can also independently deal with visualization options to generate unique views of a project quickly as well as allow print layout management. The making of project is fully optimized as the application transforms the building design processes consisting of modeling to rendering, and up to interactive virtual tours of a model, uncomplicated and simple. The instinctive GUI includes all drawing and editing commands and tools relating to standard industry standard CAD software. Solo hided roofs of several shapes characterized by polylines. Enhancements with render engine and material compatibility. Print perfection with plot options support. Addition of X-Refs with Solid ACIS. Alterations in the default values of some parameters or commands to make it well suited with the most updated AutoCAD versions (like in Tolerances and MText). Modifications facilitate plot preview and settings display even if any printer is not selected. Background color support in MText (via the Property Panel). progeCAD Architecture comes with the tools like ACIS 3D solid modeling, advanced rendering, animation creation, CTB and STB print files support, free 2D and 3D block libraries distinctive of the sophisticated DWG environment. The architectural design is improved to superior level through total image management with high-class photorealistic rendering, 3D/4D smooth animation, and material maps and topographic components.